As It Forces Itself on a Rural Tennessee Community? The Tennessee Valley Authority is a creation of government that secretly decided to build a “secure office complex” in Georgetown, TN. It’s a $300 million project that will change the face of the rural community forever. It was developed in secret for years, and TVA tried to keep it secret from citizens and elected officials. Is “Project Viper” poison for Georgetown? No one knows because TVA’s not talking. Is transparency and public input too much to ask? Stay informed and stay engaged. Please call your elected official and express your concern and ask them to tell TVA to come to Georgetown and meet with the citizens. Thank you! Greg Vital spoke Wednesday, February 13, to the TVA Board of Directors in Chattanooga on behalf of Georgetown residents and property owners. Since the disclosure of TVA Project Viper in August 2018, Georgetown residents and property owners have been calling on the Tennessee Valley Authority leadership to answer questions about the $300 million project that is certain to change the face of a rural community. Dear TVA: Five months ago, TVA employees came to Georgetown. It’s time to come back and talk. 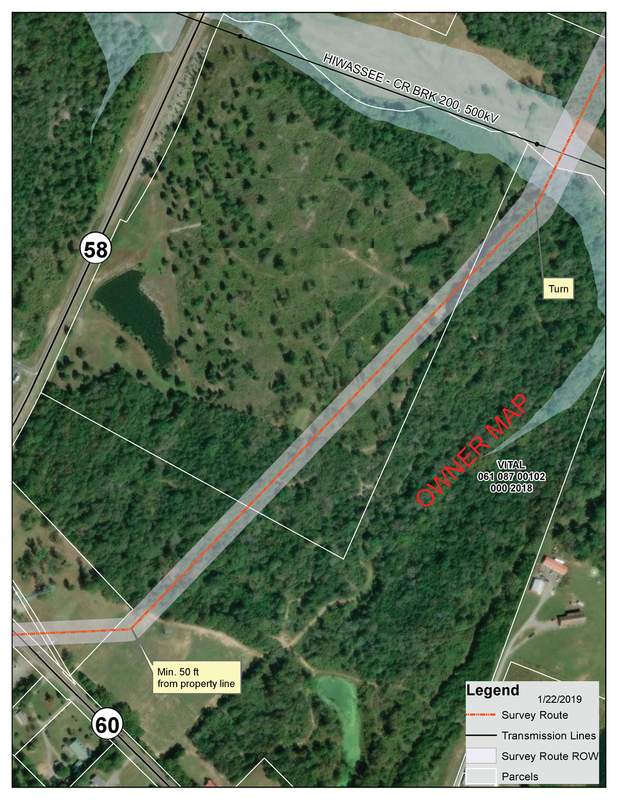 On Aug. 30, the agency held a public meeting and the letter sent to 70 or so property owners (dated Aug. 9, 2018) said the meeting concerned a $26 million upgrade to a transmission line from Hopewell to Georgetown to serve a “secure office complex.” A press release was issued on Aug. 20. TVA employees supported by an armed guard entered the private property the government agency is condemning shortly before 1 p.m. today. The environmental study team was from Knoxville. They said they weren't testing, just observing the "natural features." The officer in full body armor wouldn't say where he was based, just "Hamilton." They crossed Gunstocker Creek and onto Project Viper, TVA's $300 million new secret city in Georgetown, around 2:45 p.m.
TVA is moving aggressively to complete its ‘Quick Take’ possession of the 4 private properties in Georgetown through Federal Court action necessary to expand the last 1 mile of powerline easement they do not own through eminent domain for Project Viper. But first, archaeological, architectural and environmental studies are underway by one of the most respected firms in the Region, Mid South Consulting along the 4.25 miles of existing right of way from Hopewell to Georgetown. Lawyers for Georgetown property owner Greg Vital went to court Friday and ask Federal Judge Sandy Mattice to set aside the court’s order giving TVA immediate access to the property the TVA needs for Project Viper, a $300 million “secure office complex” that moves the agency’s power control plant from downtown Chattanooga to Georgetown in Meigs County. TVA didn't even give the property owners time to respond to a lawsuit filed Nov. 20 before it steamrolled its way into federal court Friday morning, where TVA lawyers requested and were granted -- using the eminent domain powers of the TVA Act of 1933 -- immediate possession and access to four properties in Georgetown adjacent to Project Viper, TVA's new, $300 million secret city. VA filed suit on Tuesday, Nov. 20, against four private citizens in order to take their private property for Project Viper in Georgetown. Property owners found out in the media. TVA has done nothing it said it would do since over the past 90 days. Below is a statement from Greg Vital, one of the property owners who has tried to work with TVA without success. September 2017, TVA received a consultant’s report outlining how to provide water and wastewater service to its “secure office complex” in Georgetown. No one other than TVA knew anything about the project until the third week of August 2018. TVA Files with TDEC for "Project Viper"
Is this the best TVA can do? TVA IS INEVITABLE. But the continued destruction of the landscape is not necessary. Citizens deserve information and more transparency from TVA. TVA operates in seven states all over the south and owns almost 300,000 acres of land. With its property or what it can buy, how was this site chosen for the "secure office complex?" And the best path for a new transmission line is across the private property of four residents in Georgetown?